Another maxi dress for you guys today! I am not kidding when I say I live in maxi dresses. I LOVE this one so much! It is a little on the low cut side so I put a black lace bandeau top underneath and I really love the way that it looks. I love this necklace and cuff that I am wearing from my friend Amy's new online jewelry store How Gorgeous! Both of these pieces are so different from anything that I have. And this necklace just worked perfectly with this dress. Today How Gorgeous is offering all SOS readers a discount code! Use the code HOWGORG5 at checkout to get $5 off of your entire order. The discount code is good from today up until August 1st! I hope you al have a great weekend! We are spending the majority of our weekend Nursey Furniture shopping and I can't wait! I absolutely love that maxi dress!! Looks so great on you!! Hope you have a wonderful weekend! You look beautiful in this maxi dress, such a great find! Pretty dress! I love the details on the top. Love these cut out details on the top of dress! And the leopard clutch too! Great look! 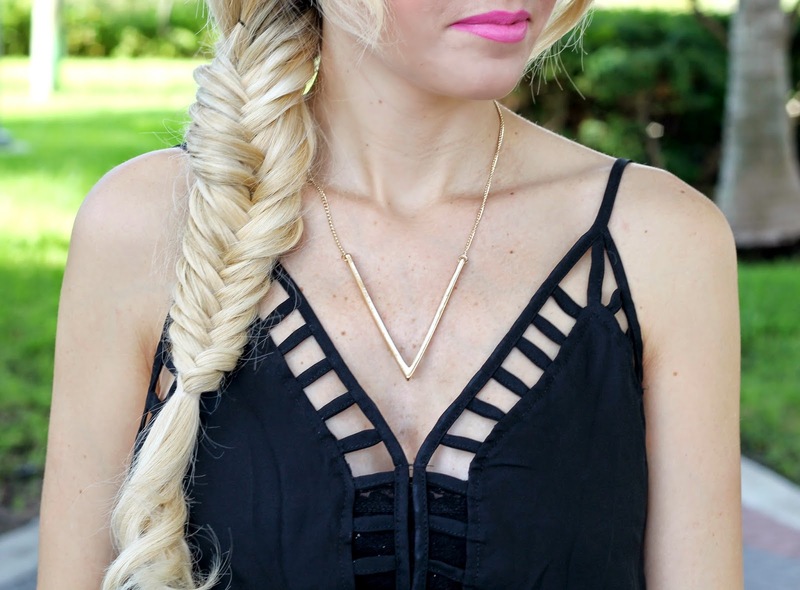 Fab look, and I love the braid! is your friend's boutique going to sell the necklace youre wearing? I didn't see it on the site. I love how you styled the bandeau top underneath. that was pretty genius. and I love that cuff. gorgeous! have fun shopping for your nursery..so exciting! Great dress, and in love with those shoes. I love this dress - and love the shoes!!! i am in love with this dress! and how cute the bandeau layered underneath looks, too! I love your hair! I wish I could get my hair to do that without looking silly! Love the details on the top bust area! This is gorgeous and I'm loving your hair too- so pretty! Such a cute look! Loving that dress! The cutouts are too fun!